There are wonderful running opportunities heading north from Victoria, along the Haro Strait. Beach Drive is a waterfront road stretching for nearly 11 km, with a good sidewalk and shoulder on the water side as you head north. The terrain and views are varied — sometimes right along the water, and other times above it (so there are some hills!). There are water views about 1/2 the time, but the area also boasts spectacular homes, pretty neighborhoods with period lighting, marinas, beaches, a golf course, and other features that make for a scenic run. 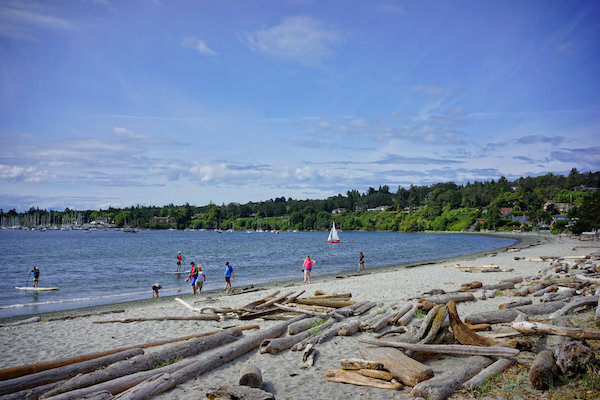 The most scenic sections (heading north) are: from Walbran Park to McMicking Point (1.3 km); the 3 km from Oak Bay Beach to Cattle Point (including a waterfront esplanade along Willows Beach). Past Gyro Beach, the road turns more inland. Note: Great food and goodies in Cadboro/Gyro at Sinclair Rd., right off the main road. Also you can run one way and take the bus back. 2 km: Walbran Park, beginning of Beach Rd. Option to take the bus back, which runs along Cordova Bay Rd.